The sunset we almost didn’t see. I knew it would happen. We were in Southeast Asia; it was inevitable. 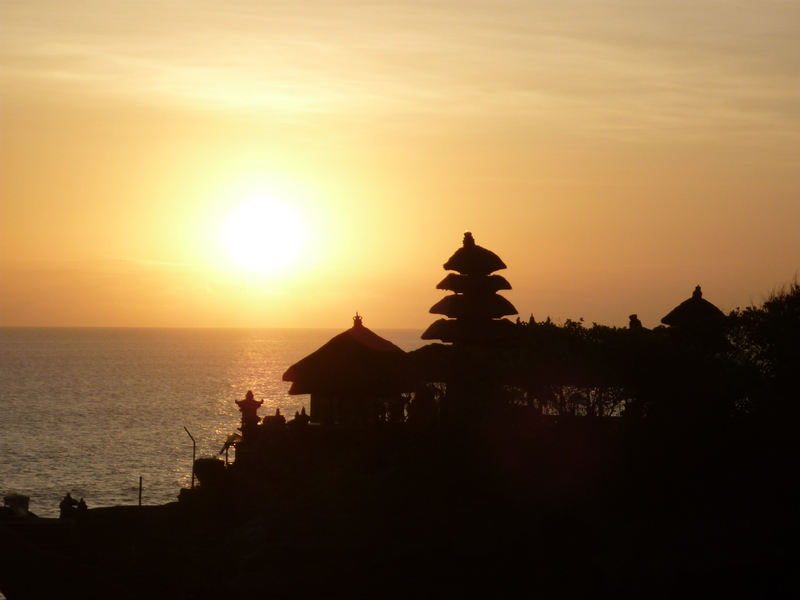 I just didn’t think that our encounter with a squat toilet would take place at Bali’s spectacular Tanah Lot right as the sun moved in for an incredible and blazing appearance. The day had gone so well, too. We arrived at the sacred temple with plenty of time. Jerry, the driver we hired for the day, gave us a tour and explained the significance of the Hindu pilgrimage spot. Knowing the importance, we lined up to receive a rice blessing from Hindu holy men. The blessing was definitely one of the highlights of the day. Feeling special with the rice clusters on our foreheads, Kurt and I felt even more impressive because our kids, Eddie and Kasey, were a big hit with Asian tourists. Various people stopped to say “hello” to the kids. 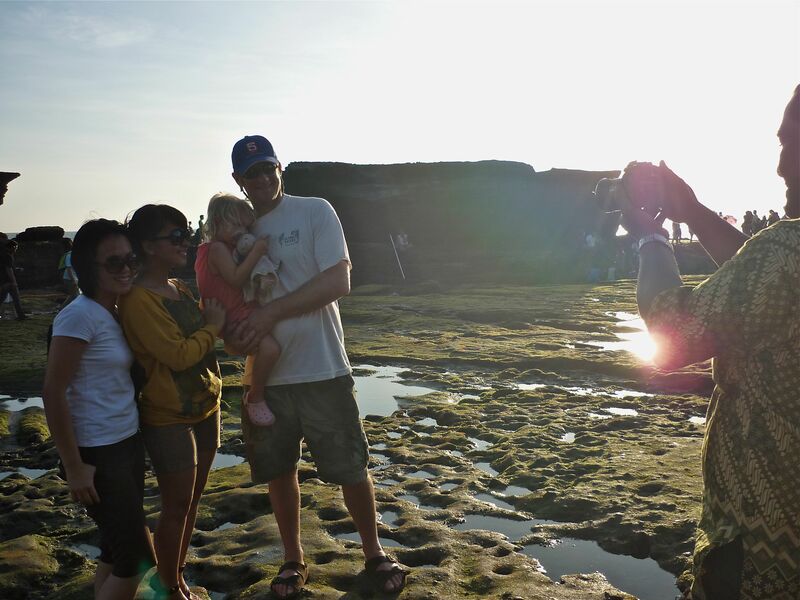 An Indonesian family even asked to pose for a photo with three-year-old Kasey. I came up to the scene after looking for shells with Eddie. Kurt (merely a prop) stood holding her with the family. Despite the lavish attention, our mini celebrity began complaining of a tummy ache, which of course, I basically brushed off as a result of all the excitement. Little did I know, however, what was brewing in her GI tract. Soon, she whined to go to the toilet. 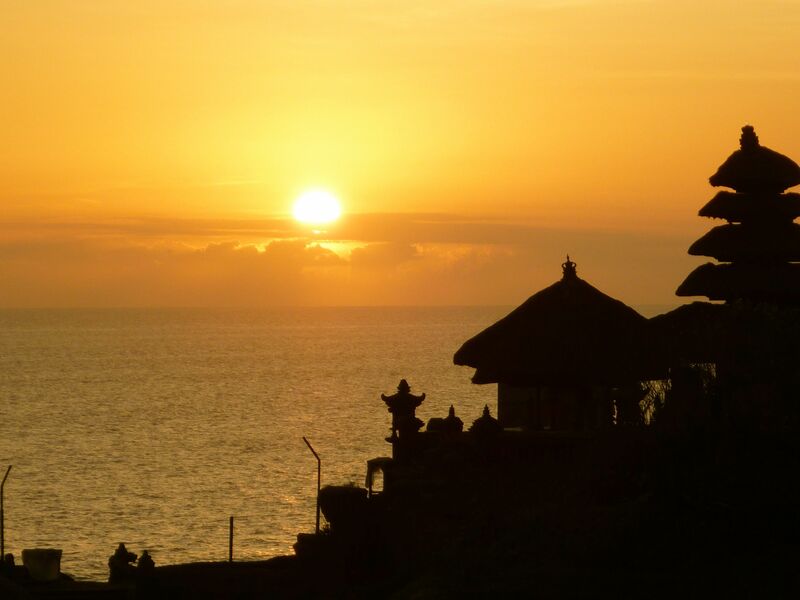 Not a big ordeal, I thought, because Tanah Lot is such a tourist attraction, restaurants and cafes line a hilltop terrace, overlooking the temple. Not to mention, we had lucked out accessing toilets during our stay in Bali. Because the Balinese revere children and family, all we had to do was make our request with Kasey in full view. In fact, in Ubud, we had entered a shop and asked if there was a toilet, and then the proprietor led us to his personal toilet in his home next to the shop. On another occasion, we used a cafe’s toilet that immediately induced gagging and then burning of the eyes. Although a flush toilet stood in the corner, the space was filthy and putrid. In fact, I think that may be where our problem began. 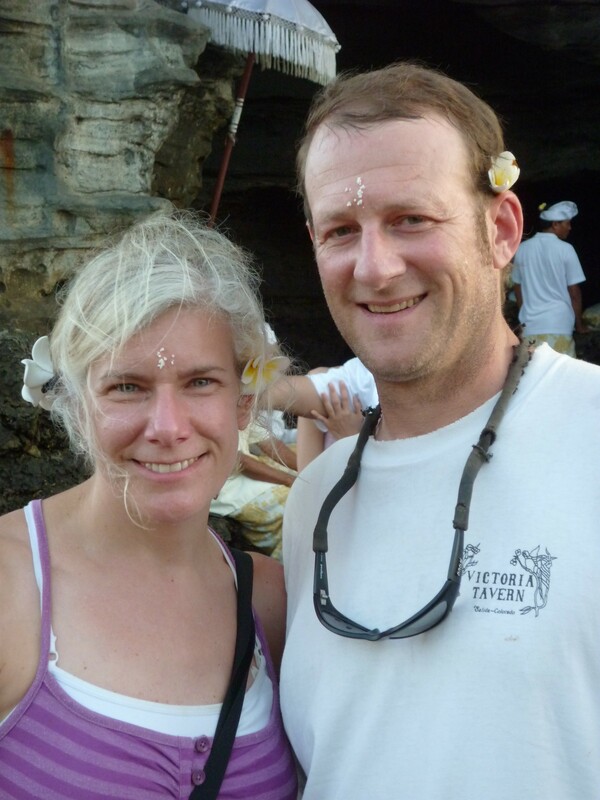 At any rate, to get Kasey to a toilet at Tanah Lot, Jerry and I took her to one of the many restaurants on the terrace. Jerry escorted us to a bar and talked to the owners. I received the usual reaction, which was complete kindness and understanding that my child needed the toilet. I told Jerry that I would meet up with him, Kurt and Eddie. It was getting close to show time, so I took Kasey into the bathroom. During that visit, I realized why Kasey’s stomach churned. She had it — definitely — Bali Belly. After finishing for the moment, we came out and somehow could not find Kurt, Jerry and Eddie. Since this sunset was a priority, I got a table anyway at a spot with a promising vista, ordered Kasey a Sprite and hoped for the best. “Mommy, I need to go,” I heard her say before we even received the Sprite. My empathy for my own child competed with the desire to see this sunset. I snapped into reality, and when the server came by with the Sprite, I asked if we could use the restroom. He said they didn’t have one. So leaving the Sprite momentarily, we searched for another toilet. Trying not to annoy the owners, we didn’t go back to the first cafe. I found another restaurant, and Kasey, despite her pain, completed her task. Things were not looking particularly good. Finding our table and seats with the Sprite, we arrived as the light began to glow and the sun lowered. “Mamma!” Kasey whimpered. I debated whether to just have her explode all over me. However, obviously, that would not work. It was a complete race. Again, I tried to find another toilet that we hadn’t already used. Fortunately, another kindly couple brought us to the bathroom in their cafe. Sweet. We were set, and I was confident we would still make the sunset. Whoa — upon entering. Not what I expected. I took it for granted that these tourist restaurants would all have flush toilets. Here it was. I had read about it, but not seen it — the squat toilet. Nice timing. I looked at it for a moment to figure it out. A small sort of tub like structure with a big hole, it seemed like a combo squat toilet and shower area since water from a spigot was flowing all over the place. I then held Kasey up and over. I was the one doing the squatting as I tried to balance and avoid having either of us touch anything. The floor was very wet, but at least, the flow didn’t seem yellow or brown. I wasn’t exactly sure what to do next, but a bucket of water waited nearby. I just dumped a deluge of water down the hole after Kasey was done. The real trick was figuring out where to put her since the place was essentially flooded. A huge trooper, she rested on my hip as I tried to reach for some hand sanitizer in my purse even before we left. For the moment, Kasey was done. Thanking the store owners, we rushed back to our table and ran into the boys on the way. Ultimately, we all sat down as brilliant oranges and yellows layered the sky and silhouetted the temple. The soothing glow must have calmed Kasey’s system, because she didn’t need to go again. Once the oranges turned into blues and purples, I thought: “Victory!” I didn’t know which was more of a score: making it in time to see the post card perfect sunset or with her ballistic Bali Belly, my daughter and I surviving a squat toilet. 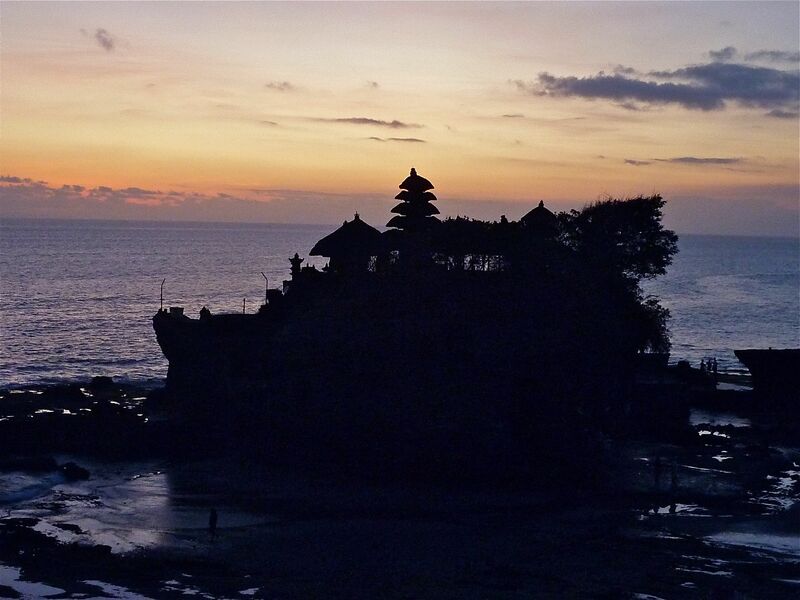 This entry was posted in Asia, Culture, Family Travel, Indonesia, Southeast Asia, Travel, Uncategorized and tagged Bali, Bali Belly, family travel, squat toilet, sunset, Tanah Lot, travel misadventure, Travel oops by stephglaser. Bookmark the permalink.